For our fourth anniversary, Josh's gift to me was a weekend trip to Hill Country. Sticking with the traditional anniversary theme of fruit for your fourth year of marriage, he determined his gift to me was "grapes" (which I think he totally came up with on the spot when I asked him what traditional fruit themed gift he got me. He's lucky Fredericksburg is known for it's vineyards). We drove in on a Friday afternoon and had good intentions of catching some BBQ in Llano on the way in, but thanks to good 'ole Dallas traffic, we didn't make it. 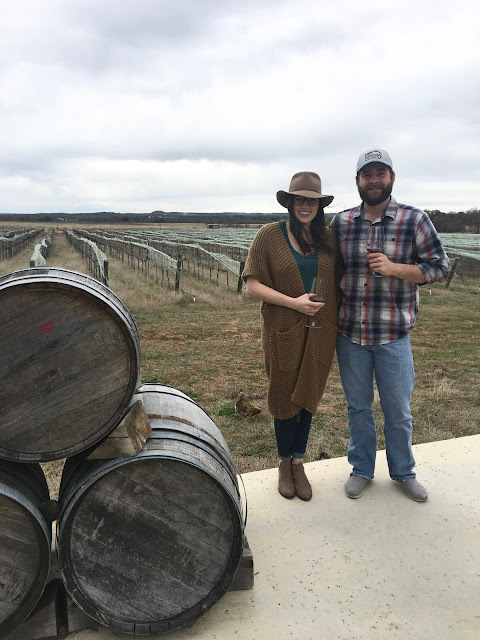 We spent our days in Fredericksburg wandering around vineyards of Texas Hill Country sipping local wines, and we spent our nights in the cutest bed & breakfast tucked inside a brewery. The Fredericksburg Bed & Brew was smack dab in the middle of downtown Fredericksburg. The location was prime (our favorite wine bar Lincoln Street Wine Bar was just across the street!) and they even give you tokens for three free beers included with your stay. We got super lucky with an extremely rare weekend of warm weather in January, which also meant the city wasn't too terribly crowded. Saturday morning before we vineyard hopped we visited Garrison Brothers Distillery (to appease my whiskey lovin' husband). Josh has never been a huge wine drinker, but I think our tasting at Hilmy Cellars converted him to the dark side. They were so informative and excited about their wines, and very proud of what they had to offer. We thoroughly enjoyed sitting on the patio with the chickens, guinea fowl and goats (who provide natural insect and weed control at the vineyard). The highlight of our trip (for me, at least) was lunch at Vaudeville, the cutest little sandwich shop tucked inside an art gallery/home decor store. I had one of best coffees of my life, and Josh and I were both mesmerized by their fresh sandwiches and the cookies. 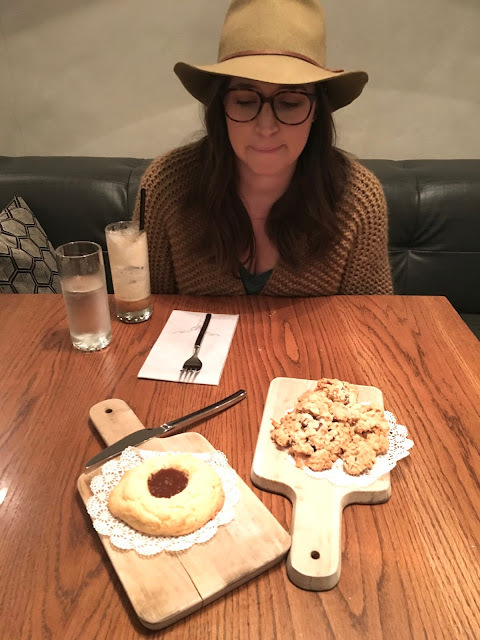 It reminded us of our favorite little sandwich shop in Downtown McKinney, Patina Green. We also had some phenomenal meals at Otto's & Sunset Grill, thanks to the recommendations of friends. 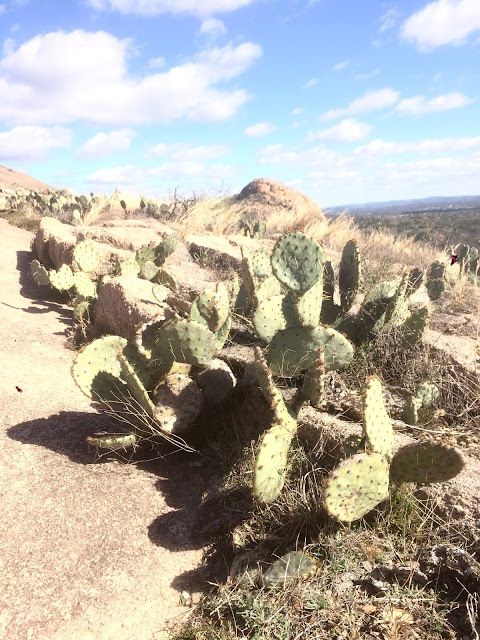 On our way out of town Sunday, we capped off our trip by participating in every Texan's rite of passage: hiking Enchanted Rock. The bungalow looks just amazing. Too bad the weather is too cold to enjoy the sun in that hammock. But, of course it wouldn't be much of a ski trip if the weather was warmer.